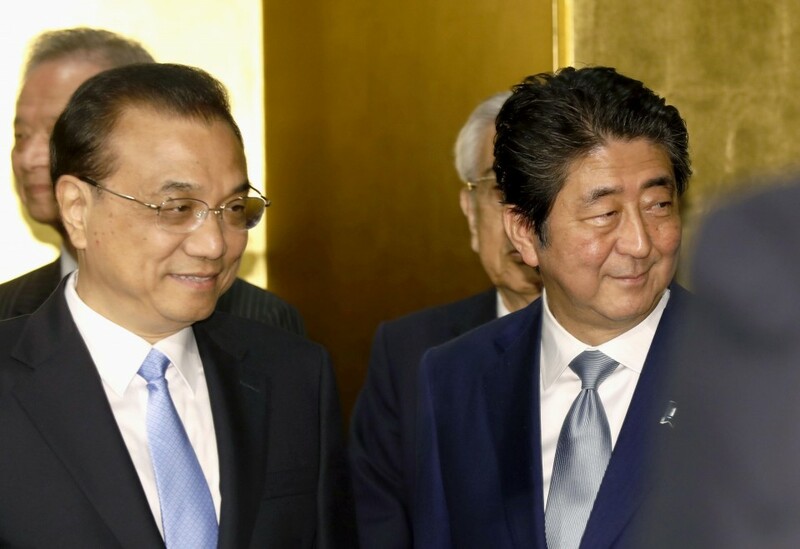 Chinese Premier Li Keqiang on Thursday urged Japan to join China's "Silk Road" infrastructure project, saying its participation would likely contribute to Prime Minister Shinzo Abe's economic stimulus policy. "Our working-level cooperation will evolve. Our One Belt, One Road initiative will be coordinated with Japan's growth strategy," Li said in a speech in Tokyo at a reception celebrating the 40th anniversary of the signing of a bilateral friendship treaty. At a summit between Abe and Li on Wednesday, Japan and China agreed to launch a public-private sector council to consider specific projects of cooperation related to Beijing's "One Belt, One Road" cross-border infrastructure initiative. China has sought to expand its infrastructure networks in Asia, the Middle East, Europe and Africa to attain its goal of connecting countries along the ancient Silk Road more closely, but concerns linger in Japan over Beijing's transparency in its financing. Li's remarks suggest that China is willing to cooperate with Japan to tackle protectionist moves by U.S. President Donald Trump, as trade tensions between Beijing and Washington have been intensifying. In the speech, Li also said China and Japan "have responsibilities to oppose protectionism and protect free trade as the world's major economies," adding Beijing and Tokyo should join hands to shore up the global economy. China and Japan "have a wide range of common interests," Li said, expressing hope that the two countries will deepen cooperation in such fields as innovation, state-of-the-art manufacturing and finance. Abe said at the same reception, "Japan and China have entered an era of partnership from that of competitiveness. We want to promote concrete development in Asia by private-sector companies. We want to lead Japan-China ties to a new stage." As for the recent situation surrounding North Korea, Li said that China and Japan will work in tandem to resolve the nuclear crisis and achieve denuclearization on the Korean Peninsula. The reception was hosted by organizations including the Japan Business Federation, the nation's biggest business lobby known as Keidanren. Around 1,400 business leaders and senior officials of groups running Japan-China private exchanges attended it. It is the first time Li has visited Japan since he became China's head of government in 2013. 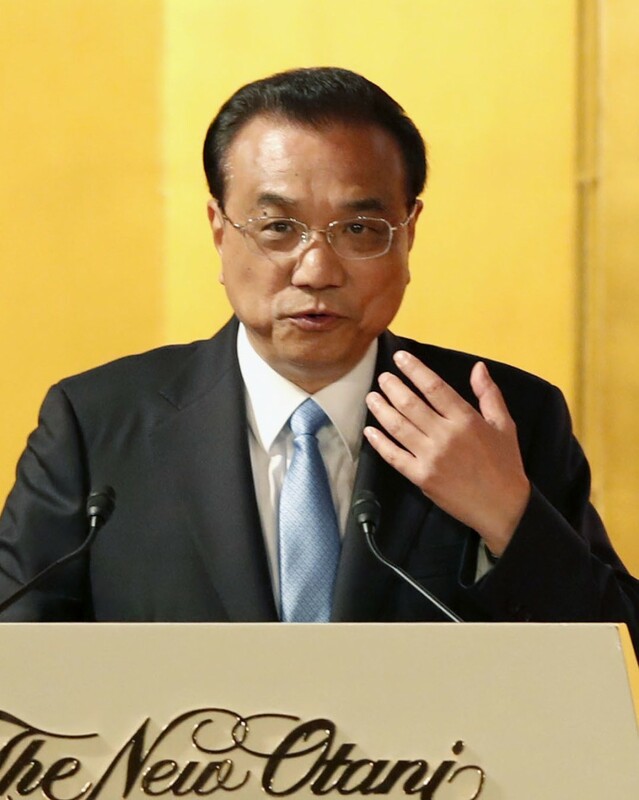 The last Chinese premier to make an official visit to Japan was Wen Jiabao in 2011. Li, who is on a four-day trip to Japan from Tuesday, attended a trilateral summit with Abe and South Korean President Moon Jae In, as well as bilateral talks with them on Wednesday, around two weeks after the landmark inter-Korean summit on April 27. The premier had an audience with Emperor Akihito earlier Thursday. He is scheduled to visit the northernmost main island of Hokkaido from Thursday night through Friday afternoon. In recent years, Sino-Japanese ties have been mired in a territorial row over the Senkaku Islands -- called Diaoyu in China -- that escalated after the Japanese government effectively put them under state control in September 2012. Bilateral relations have clearly been improving, however, following the reappointment of Xi Jinping to a second five-year term as Chinese president in March.